Until the 19th century, the water power of the River Severn was used to drive water wheels. 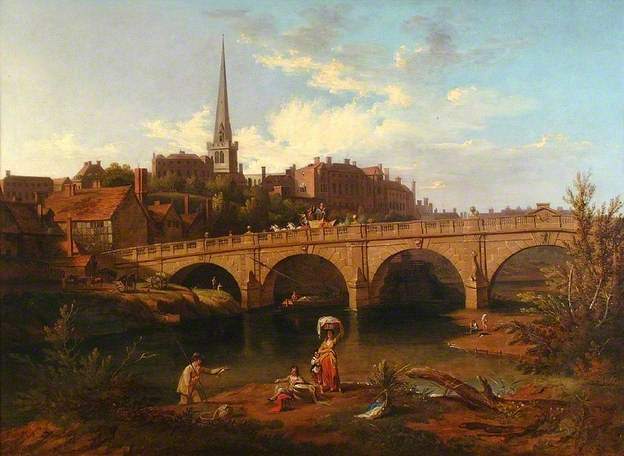 In a painting of English Bridge by Edward Dayes *, painted around 1804, a water wheel can just be seen through the 3rd arch from the left but there has been no use of water power in Shrewsbury since then and hydro-electricity has never been generated from the river. However, the encouragement of renewable sources of energy through the introduction of Renewable Obligation Certificates in 2002, followed by the introduction of Feed-in Tariffs in 2010, has made it possible to consider using the water power of the river once again. The first hydro-electricity in the world was generated in England in 1878 by Sir William Armstrong at Cragside in Northumberland. The Shrewsbury Weir provides a suitable location to generate the first hydro-electricity from the water power of the River Severn.